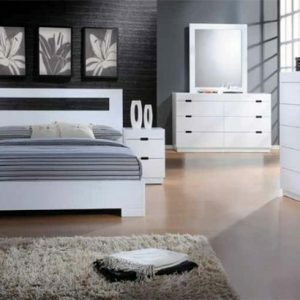 The stunning bedroom set is designed with a crisp white finish and then accented with metallic pointed feet and chrome drawer pulls. The sleek storage items are ideal to keep your clothes, bedding and linen. The upholstered bed’s headboard is designed for you to relax as you watch TV or read a book.